British Sewing Awards – MIY Workshop was 3rd! I had some pretty impressive news last week, MIY Workshop came 3rd in Sew Magazine’s British Sewing Awards in the “Best for Sewing Courses/Workshops” category. I have to admit that usually nothing less than the best is good enough for me, but this was a national competition open to the many businesses teaching people to sew across the UK, so I’m actually rather chuffed with 3rd. And, dear reader, this is mostly down to you, as I relied on you first of all to nominate me back in September of last year and then to vote for me, so a big thank you bear hug from me to you. 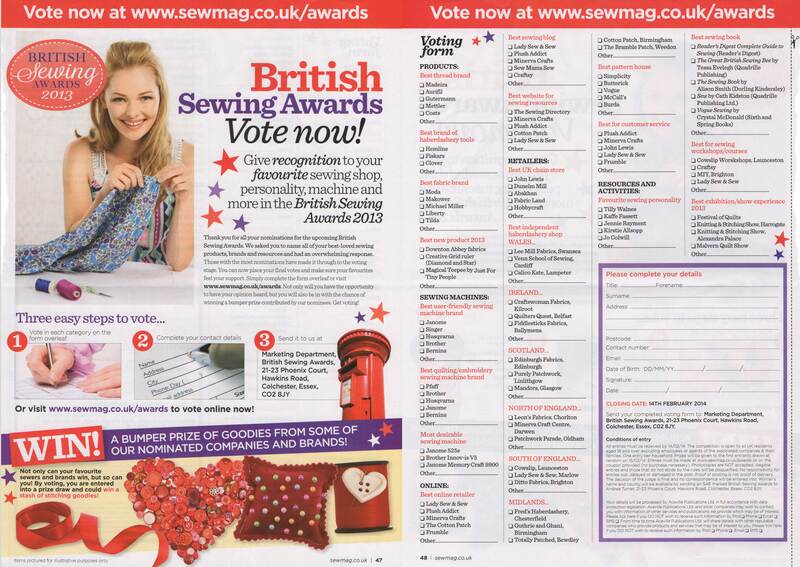 Sew Magazine’s British Sewing Awards – I’ve been Nominated!!! I was (to put it mildly) dead chuffed the other week to find out that I’ve been nominated in Sew Magazine’s British Sewing Awards under the category “Best for Sewing Workshops / Courses”! The nominations process has been ongoing since September and those receiving the most nominations have now been shortlisted for the voting process. I am soooo flattered that so many people nominated me, a huge thank you from me to all of you that took the time. Voting is now open via postal votes and online until February 14th next year. Good luck to everyone who has been nominated, especially Ditto Fabrics in Brighton……! Sew Magazine are currently looking for nominations for the British Sewing Awards via their website and in their magazine. You can vote for your favourite sewing machine brand, best book and best of all……..Best Sewing Workshop / Course and Best Sewing Blog. Now I’m not so presumptuous as to assume anyone would nominate me, but……..if you happen to enter, I hope I will be fresh in your mind! It’s easy to do, this link takes you straight there: http://www.sewmag.co.uk/awards/ just nominate in the categories you want and put N/A in the ones you don’t. Takes only a few mins…….